DRESS YOUR DOLL FASHIONABLE ! Has your daughter been dressing her doll in the same hair style day after day? Has your daughter been feeling so boring day after day?Let's have fun! Color: 9 Colors， 9 PCS One Set. 9 COLOR TO CHOOSE (Turn to right selection) ★white ★red ★orange ★yellow ★green ★Lake blue ★blue ★purple ★pink Material： 100%Top QualityJapanese Fiber. Safety: Without any chemical dye to damage your hair & health. Wear hair notes extensions: 1. Don't wear your extensions to swim in, this will tangle them and dry them out. 2. You can curl or trim them to DIY your own hair style. 3. Be sure to take your extensions out before going to bed, carefully clip by clip to avoid damaging your own hair. ★It's a 18 inch doll, but can be worn on your hair too! 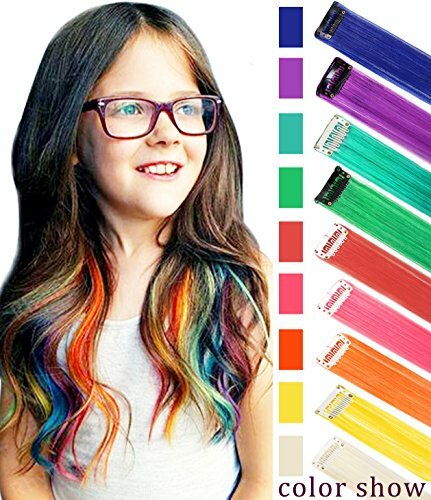 ★We have 9PCS different Hair Extension Colors that can be paired with your style to add fun! If you have any questions about this product by Rhyme, contact us by completing and submitting the form below. If you are looking for a specif part number, please include it with your message.